This entry was posted on Thursday, June 23rd, 2011 at 11:47 pm	and is filed under Breakfast, Videos. You can follow any responses to this entry through the RSS 2.0 feed. You can leave a response, or trackback from your own site. I always enjoy your Crabby Cook videos. Please keep them coming. You’re a multi-talented individual whom I’ve enjoyed all facets of your creative output. Your informative and witty cooking expertise is just your latest endeavor that I relish (and I don’t mean the condiment). Hi Jessica, you light up my days and always make me smile I love it. I love the cow timer, moo! What was the music in the background? You’re the greatest, and yes I hate it when I try to peel a hard boiled egg but the shell sticks to the egg, ugh. Say hi to Oliver! Woof! The fascinating thing to me is that you’ve actually cracked the case (not the shell) and determined the EXACT number of minutes required to execute this process, i.e. the 2-7-2 method (….which clearly suggests that perhaps I’m over-boiling at my usual 15…ya think?!) 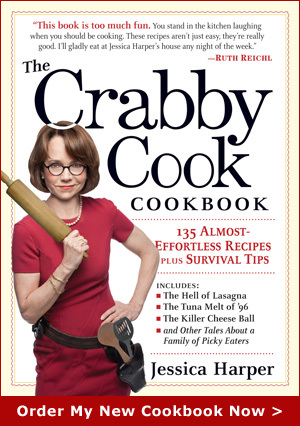 So, duly noted, Ms. Crabster…but I may have to wait til next Easter to see. That’s a great video! Boiling and peeling a perfect egg isn’t easy! I’m sure I’ll be able to do a great job next time with your great tips!! Well, now I know what my problem is lol. I was under the impression 15 minutes was standard practice (no idea where I got that though) so its time to correct my way of thinking so we can actually EAT the eggs I cook LOL. Ok I thought it was just me that could not get my boiled eggs correct.